Fall is here, again. The shelves are full of bulbs for planting right now, for Spring blooms. But, most of them bore me. I bet they bore you, too. For my own sanity, I have ordered some less-common and truly beautiful varieties to add to my own garden and yours ! 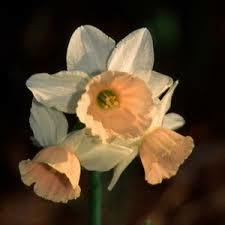 #1 on this list has to be the adorable Narcissus called ‘Katie Heath’ . A short grower ( 12″), with large flowers that possess the most charming flesh pink stubby trumpet against a white perianth (petals). This tasteful combination of colours would look great planted with the soft,soft faded blue Muscari ‘Valerie Finnis‘ . 99.9% of ‘Grape Hyacinths (Muscari) are dark denim blue, but ‘Valerie Finnis’ is the one to get. I planted just this exact combo in random dapples under my 13 Weeping Silver Pear trees (Pyrus salicifolia ‘Pendula’) out at the farm. They give the look of an olive grove, which was my intention. ( Olives are not hardy where I live. ) ‘Katie Heath‘ bulbs are $11.99 a dozen are are going to be a sell-out ! 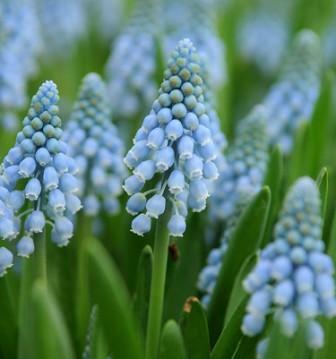 Below: Muscari ‘Valerie Finnis’ is a very hardy, easy little bulb for those suffering from bulb fatigue ! 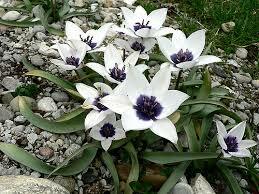 Another treasure this year is a species tulip, Tulipa humilis alba coreulea oculata . I am going to grow these tiny bulbs in a clay pot, to keep my eye on them. The cobalt blue stain on the base of each white petal is unlike any other tulip ! Judging by the size of the bulbs, I expect a miniature tulip . Three tiny bulbs sell for $8.99 , so you know you won’t be seeing this tulip at the gas station! ALlliums are a pretty kooky group in general, but now they are getting to be ‘old hat’ as well. For this season, I found two new giant purple ones: ‘AMBASSADOR‘, and ‘BEAU REGARD’. 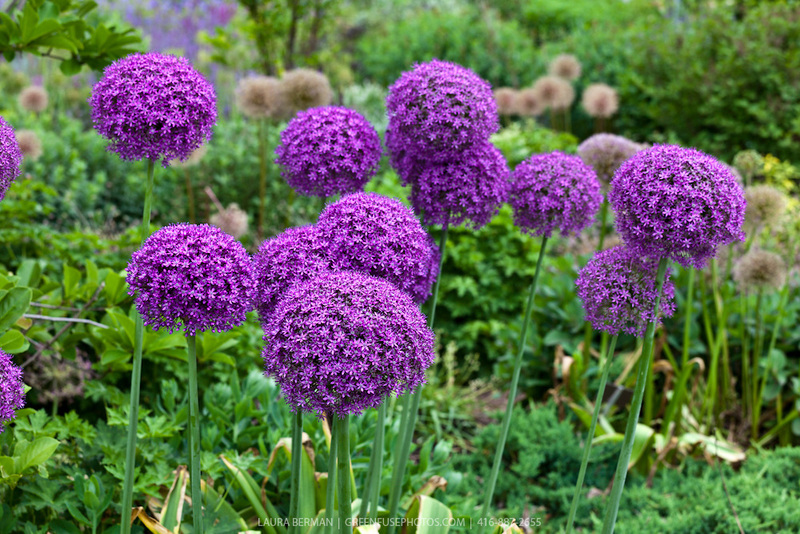 ABOVE : Allium ‘AMBASSADOR’ has 8″ + flowerheads that last for months. 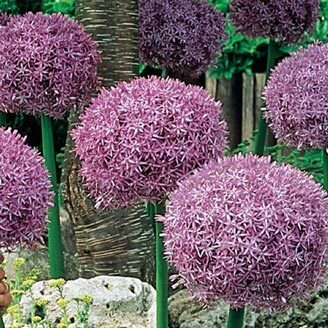 ALLIUM ‘BEAU REGARD’ 8” flowerheads are soft purple.